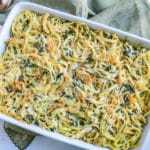 Monterey Chicken Spaghetti is an easy baked pasta dish that will quickly become a family favorite. 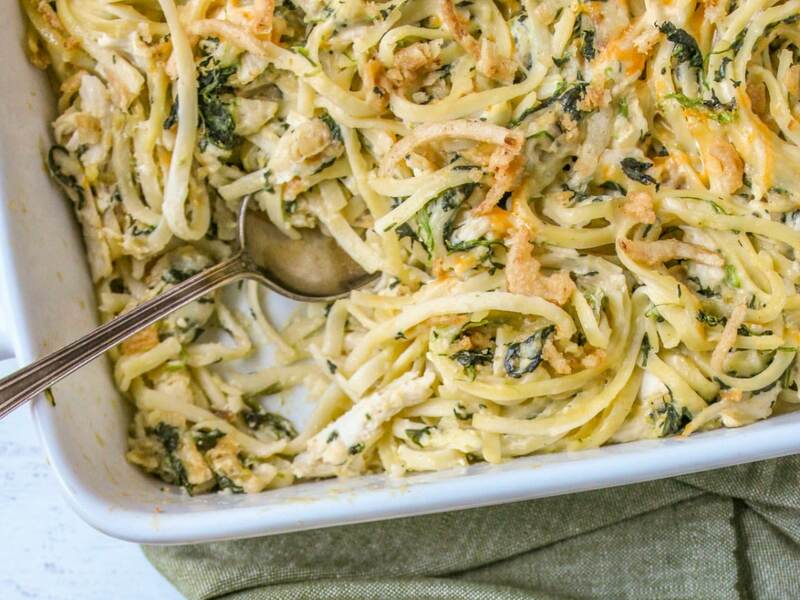 It’s packed with chicken, spinach and pasta and topped with crispy fried onions. The best part? This dish ready in under an hour giving you a hearty, delicious dinner option for your busy life. My husband went completely bonkers (don’t tell him I said that) over this Monterey Chicken Spaghetti. In fact he had a BIG second helping and asked me to make it again next week before I’d even finished a single serving. Over the years I’ve tried a lot of chicken pasta recipes like this Ro-Tel Chicken Pasta or this Cajun Chicken Pasta but this Monterey Chicken Spaghetti is our new favorite. This Monterey Chicken Spaghetti is loaded with chicken, Monterey Jack cheese, parmesan cheese, spinach and fried onions. No wonder Popeye had so many muscles! Of course if you just absolutely hate spinach you can use less or even leave it out completely. But, why would you do that when it’s just so good for you? The recipe calls for a thawed package of chopped spinach. Once the spinach is thawed you’ll need to drain off the excess water before using it in the pasta. This is really easy to do if following my tips below. 2 Microwave for 2-3 minutes or until the spinach is soft and the spinach is no longer a block of ice. 3. Place the spinach on stack of three paper towels and then wrap it around the spinach. 4. Squeeze the water out of the spinach. Make sure you do this over the sink and really put some muscle behind it so you are squeezing all the water out of the spinach. I really love the french fried onions in this recipe. They give the whole thing a slightly more savory flavor. Plus, the onions browned covered the top add a fun crunchy texture against all the pasta. If you have someone in your family that just refuses to eat onion (I’ve heard about these people thankfully none live at my house) you can leave them out completely or just sprinkle a few over each plate as a garnish. Begin by cooking the spaghetti to al dente according to package directions. 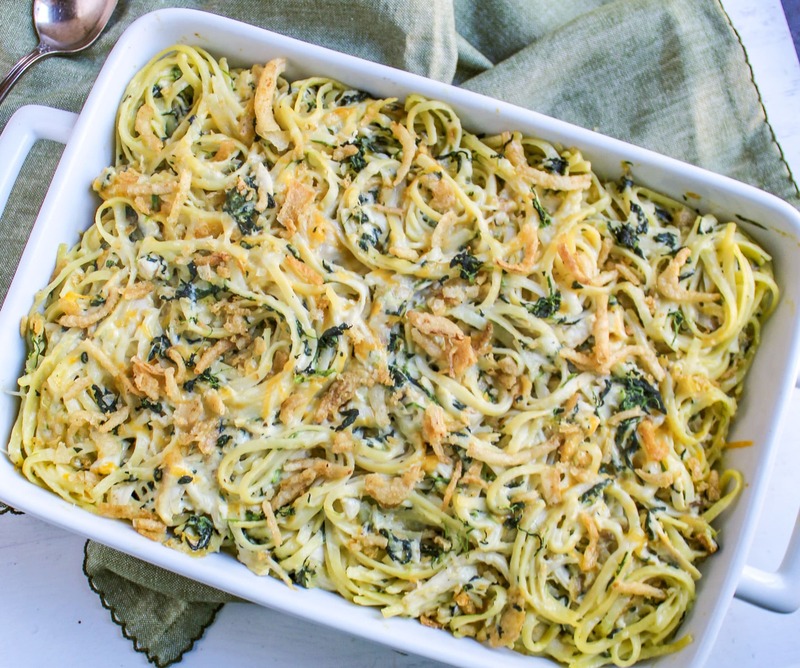 While the pasta is cooking in a medium bowl beat an egg and then stir in sour cream, cream of chicken soup, parmesan cheese, Monterrey Jack cheese, spinach, half the fried onions and garlic and onion powder until well combined. Next, drain the spaghetti and to egg mixture and then toss until the pasta is coated in the mixture. Transfer the pasta into a greased 9×13 baking dish and cover with foil and bake at 350º for 30 minutes. At then end of 30 minutes remove foil and sprinkle on the remaining onions. Then return to oven for another five minutes, or until onions are crisp and golden brown. This chicken pasta recipe is super easy and very filling. If you have leftovers you can enjoy them the next day or store in an airtight container in the fridge for 3-5 days. I mean that’s a lot of chicken and pasta so you know I know what I’m talking about when I say this was delish!! I hope you’ll love it as much as we do and that come back and leave me a comment about how much you loved this recipe! 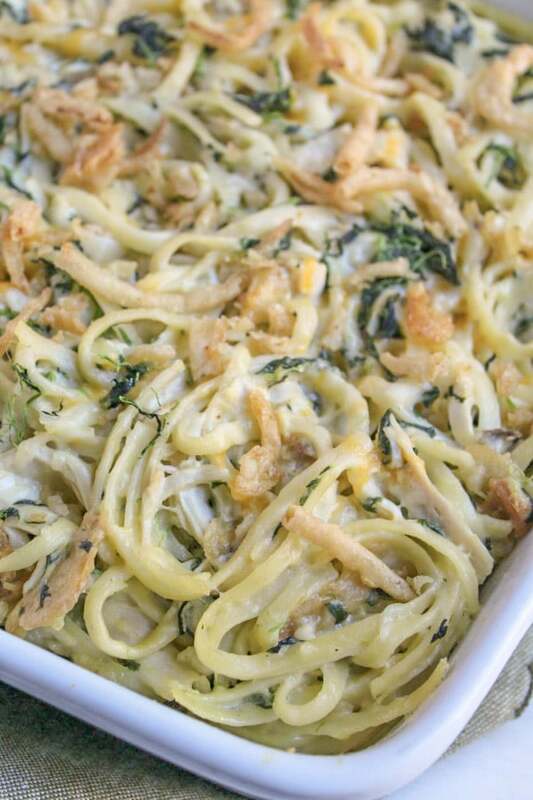 Monterey Chicken Spaghetti is packed with chicken, spinach and pasta and topped wit crispy fried onions. This is sure to become a new family favorite! 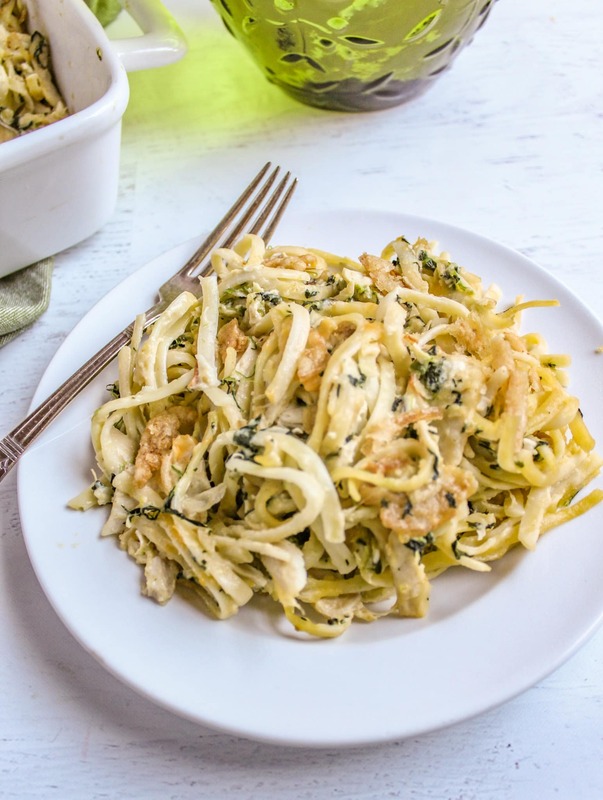 While the pasta is cooking in a medium bowl beat the egg and then stir in cooked chopped chicken, sour cream, cream of chicken soup, Parmesan cheese, Monterrey Jack cheese, spinach, half the fried onions and garlic and onion powder. Drain the spaghetti and to egg and chicken mixture and then toss to combine. Transfer to a greased 9x13 baking dish and cover with foil. Notes: How to thaw and drain frozen spinach: 1 Remove the frozen spinach from the package and place it in a microwave safe bowl 2 Microwave for 2-3 minutes or until the spinach is soft and the spinach is no longer a block of ice. 3. Place the spinach on stack of three paper towels and then wrap it around the spinach. 4. Squeeze the water out of the spinach. Make sure you do this over the sink and really put some muscle behind it so you are squeezing all the water out of the spinach. I can totally see why your husband loved this dish! I am smitten just looking at it! The crispy fried onions on top are brilliant! And, since there is spinach I can consider this healthy, right?! 😉 This is a weeknight dinner winner for sure! Pinned! You are too sweet! This dish was totally delish!! Thanks! What a fabulous recipe! I made this dish and served it to my family who were visiting from out of state. They begged me for the recipe! Woo-hoo! This Monterey chicken spaghetti was so darn delicious! It’s a quick yummy recipe for busy families. 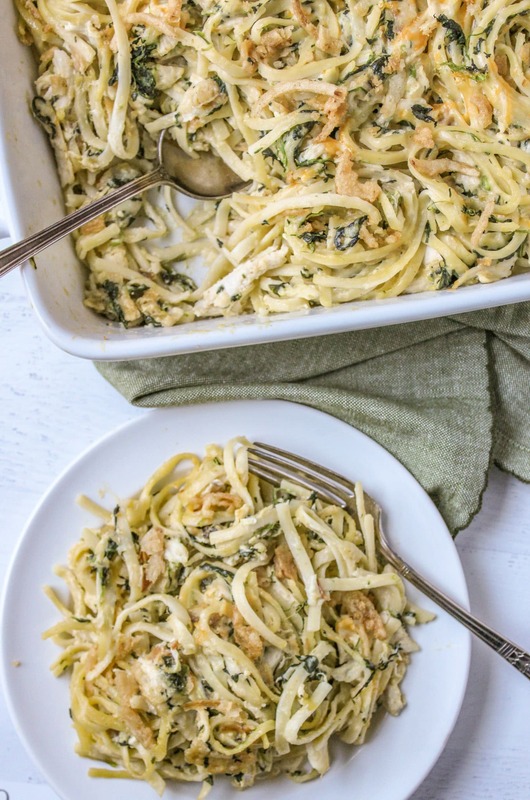 Lydia – You can totally make this with fresh spinach. I recommend frozen because it is less expensive and easier. I’m sure it will turn out delicious! I hope you love it. I made this last night and it was a hit with the whole family! I already wrote it down on a recipe card and have it filed away with all the rest of my “winners.” Thank you for sharing it with us!